If you think that hip hop style apparel is not flattering for full figure you will change your mind when you see these plus size hodies featuring different styles, fabrics, colors, and embelishments. The first is Black and Taupe Skull Patch Short-Sleeve Hoodie. Who knew skulls could be so pretty? This hoodie has skull and heart appliques adorned with ruby-red and iridescent gems. This plus size hoddie has Kangroo pocket with rib trim. Zip front. Hood lined with black and taupe floral fabric. 27″ long. 100% cotton. Machine washable. The second is an embroidered velour hoodie. Embroidery on this velour hoodie makes it extra special. This velour hoodie has long sleeves and zip front. Again there are Kangaroo pockets with ribbed trim. Drawstring hood. Knit. The hoodie comes in a blend of cotton and polyester. Machine wash. Approx 28″ long. Pashmina is a textile made from fine Cashmere wool. This wool comes from pashmina goat, which is a special breed of goat living only in Himalayas. As pure pashmina cannot endure high tension pashmina fabric is usually blended with silk in 70% pashmina/30% silk blend. 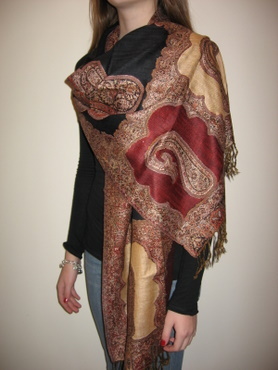 Pashmina clothing ranges in size from scarf to to wrap or stole to full sized shawl. Authentic pashmina shawls are lightweight and warm, soft and drape nicely. Cashmere products are very chic fashionable accessory and there are different styles in wearing of the pashmina.